Thanks to Green Giant for sponsoring this post. As always, all opinions are 100% my own. 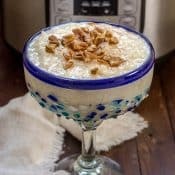 You say you don’t have a food processor to rice the cauliflower and sweet potatoes, or maybe it is too much of a hassle to drag out the food processor? 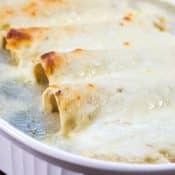 That is ok because you don’t have to with this recipe. 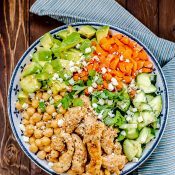 That is because Green Giant® has come out with a new frozen package of Riced Veggies, including the Riced Cauliflower & Sweet Potato used in this recipe. I love these because it removes all the work of dragging out the food processor to rice the veggies. They have done all the work for you. All you have to do is open the package and cook! The Green Giant Riced Cauliflower & Sweet Potato taste so good that no one will know that you skipped the food processor. 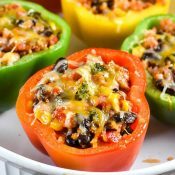 For these Vegetarian Mexican Stuffed Peppers, I also added Green Giant’s Roasted Broccoli because I love roasted veggies. 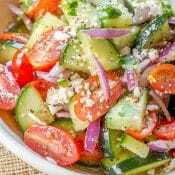 There is so much flavor infused into the vegetables when they are roasted. I just had to add the Roasted Broccoli for the flavor and to pack these stuffed peppers with plenty of nutrition. 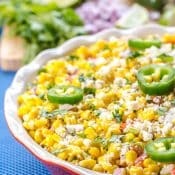 I feel good about serving these Vegetarian Mexican Stuffed Peppers to my family because Green Giant Riced Cauliflower & Sweet Potato are 100% made with vegetables, have 70% fewer calories than rice, and are gluten free and come without sauce and seasoning so you can make them and season them to your taste. 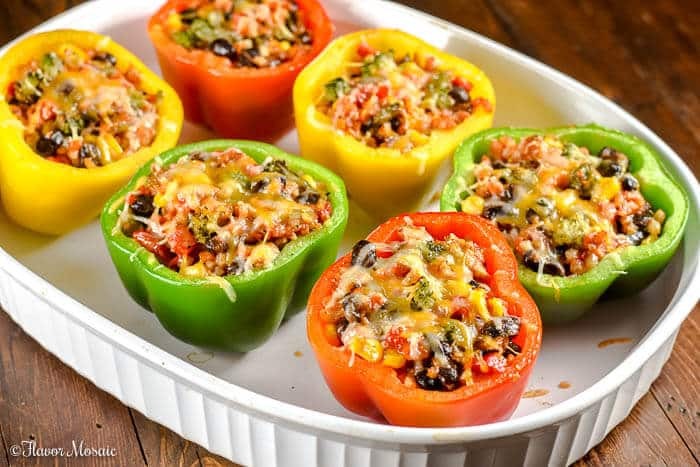 With these Vegetarian Mexican Stuffed Peppers being gluten-free and lower in carbs, they fit into almost any meal plan. 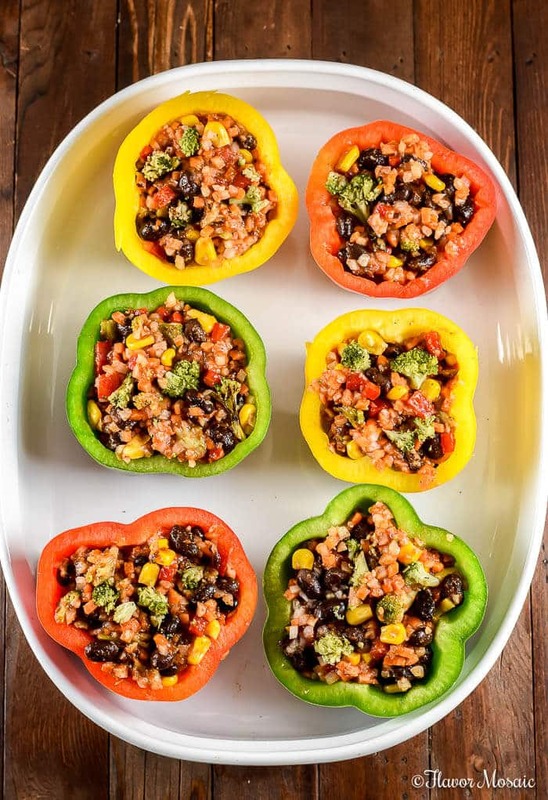 I’m so happy that I made the smart swap to swap out the rice for Green Giant Riced Cauliflower & Sweet Potatoes in these Vegetarian Mexican Stuffed Peppers. 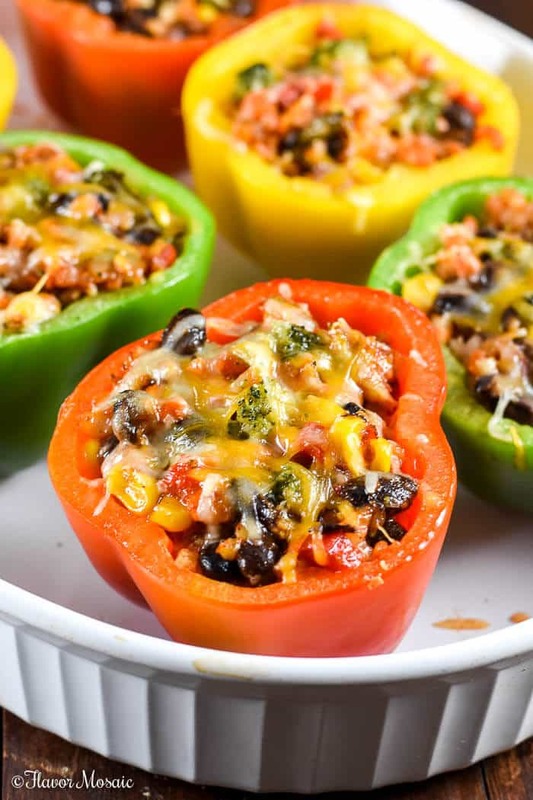 You will also love them because these Vegetarian Mexican Stuffed Peppers are so easy to make! Heat the Green Giant Riced Cauliflower and Sweet Potato per the package instructions. Heat the Green Giant Roasted Broccoli as well per package directions. 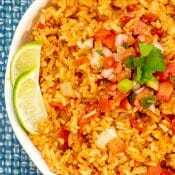 In a large bowl, add a can of black beans, drained and rinsed, as well as drained corn and diced red peppers. Add in the Green Giant Riced Cauliflower & Sweet Potato, as well as the Green Giant Roasted Broccoli. Stir everything together to combine. Then add the chili powder, cumin, and cayenne. 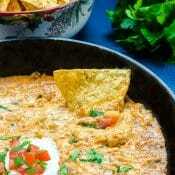 Then pour enchilada sauce over everything and stir until the vegetables are evenly coated in sauce. 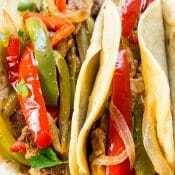 Then spoon the vegetable mixture into the peppers and, if desired, top with a little shredded Mexican cheese. 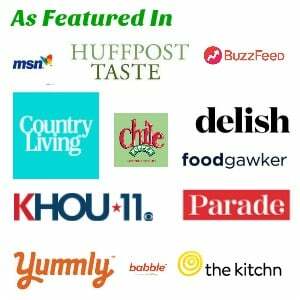 I hope you enjoy these Vegetarian Mexican Stuffed Peppers as much as we did. 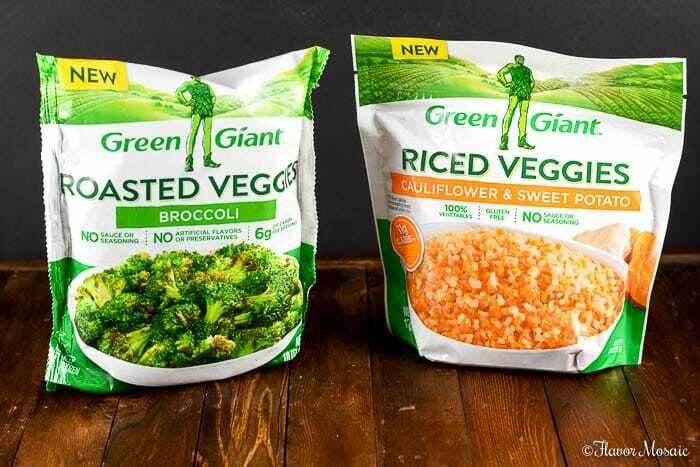 Be sure to pick up a couple of bags of Green Giant Riced Veggies at Walmart today! 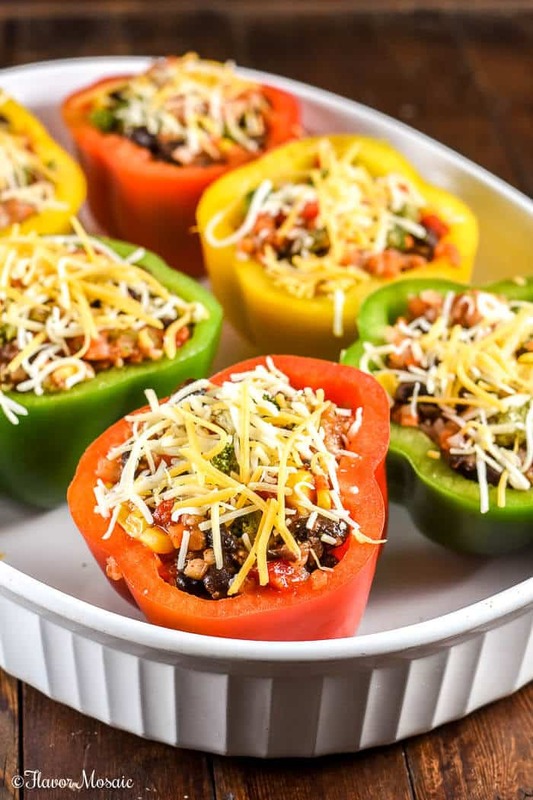 What will you be serving with these Vegetarian Mexican Stuffed Peppers? 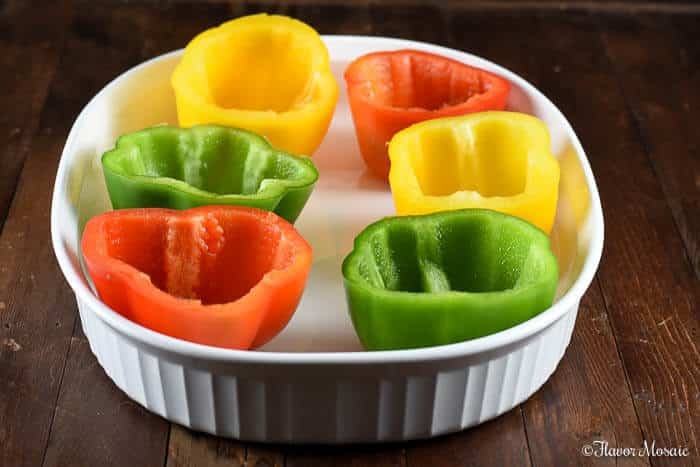 Slice the top halves off of the bell peppers. Remove the seeds from one of the halves of the red bell peppers. Dice the red pepper and set aside. Cook peppers in boiling water 5 minutes; drain. Place in a 9 x 13 serving dish. For 12 peppers you may need 2 baking dishes. Set aside. Heat the Green Giant Cauliflower & Sweet Potato per package instructions. Heat the Green Giant Roasted Broccoli per package instructions. 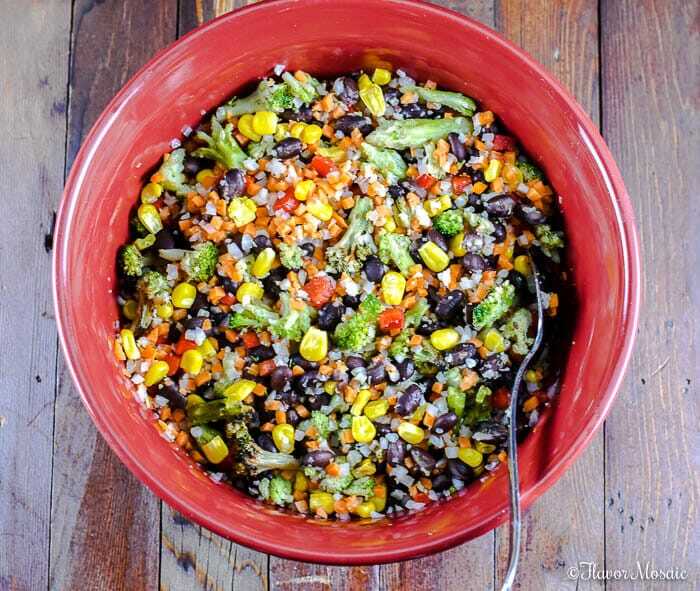 In a large bowl, combine drained black beans, corn, diced red peppers, Green Giant Riced Cauliflower & Sweet Potato, and Green Giant Roasted Broccoli. Add the chili powder, cumin, and cayenne. Pour the enchilada sauce over the vegetables and stir. Spoon the vegetable mixture into each bell pepper. If desired, sprinkle with shredded cheese. Bake in a preheated oven at 350 degrees F for 20 minutes.